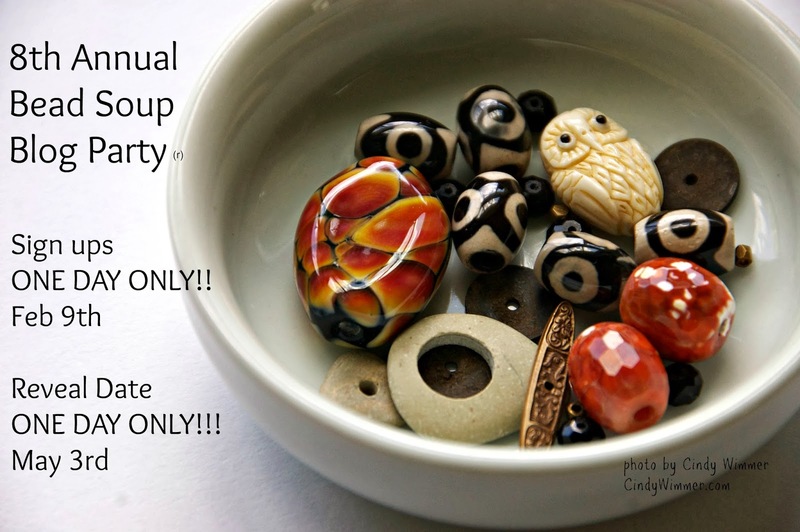 The 8th Bead Soup Blog Party ® dates are set! THIS IS NOT THE SIGN UP PAGE. 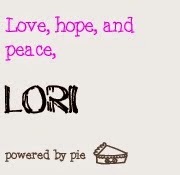 I will have more information and badges for your blog soon. Those of you who know me know I'm fighting, among other things, Lyme disease, so I'm working at a much slower pace than I would like. Please be patient but don't hesitate to comment with questions! (but it's way too big for your badge, so hang on for that). Mark those calendars! Set those clocks! 1) How long do you need notification of sign ups? Since there will only be ONE DAY to sign up (my way of keeping the numbers manageable), I was thinking a week and a half, so it crosses two weekends. How long should it be between sending beads and reveal date, keeping in mind international. (I have a back up plan if we get more than a few late international packages, like a separate mini hop, so you aren't screwed over. 3) Here's the touchy one, and I'd appreciate input.. Sometimes I've had people send me photos of their soups and they were obviously cast offs or (man I hate to use this word) junky. Some beads have come in dirty, falling apart, etc. 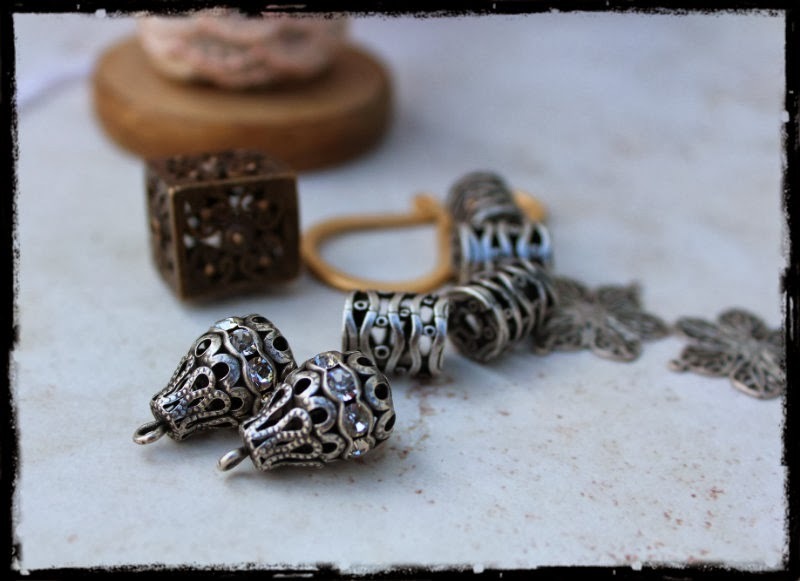 This is a once a tear event, recently written up in Jewelry Affaire magazine. So when sending think. Are you proud of your beads? They don't have to be huge strands of lampwork or expensive gemstones, but if you would, start planning NOW. My go-to is Etsy, not Michael's or Hobby Lobby (not that there's a thing wrong with that... just giving options). And I'm not playing favorites with my list, I'm rushing. 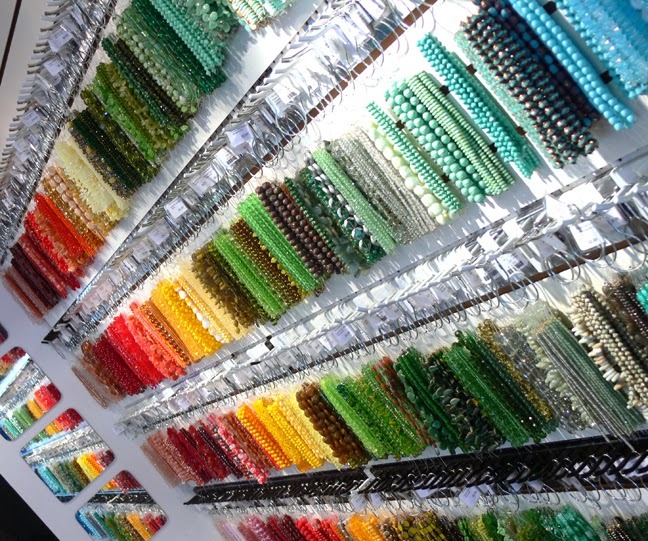 There is a file under Files in our group listing bead makers (if your not on it, add!) If it's the old one with lampworkers only, one person please start a new one called handmade beads and components. The touchy part. Technically, as artists, we should be able to use what we're given, along with our own stash. A lot of people forget you're not getting a kit, but a starting point. There's also"soup envy" and I can't help it if you like someone else's better than yours, but it CAN bring out some wild behavior (trust me). If you are truly troubled, upset, rules were obviously broken, come to me. Lisa Liddy and Tania Spivey can be contacted if I'm sick and can't get to email. Think hard about what you got, raid your bins, flip through magazines for inspiration, and contact me if it's just not gelling. I am not going to stop anyone from sending more than the required focal, pretty clasp, and few COORDINATING beads. If you want to send more, do so, knowing you may be getting a normal stash smaller than you:+ sent. THIS IS WHY ITS SO IMPORTANT TO EMAIL YOUR PARTNER, CHAT, LOOK AT THEIR BLOG. Don't send exactly what they would probably buy....no fun. But don't send something so completely different that bit doesn't represent YOU. Send beads you love. More tomorrow on how to chose. Deanna Chase, Lisa Missy, and Susan Sheehan. Chat with your swap partners! It could be the beginning of a great friendship or business partnership! We have all levels and stashed and incomes here. The focal and clasp you send should be a PRESENT. Special. Special docent have to be expensive and it's probably sitting in your stash right now. Other than my normal rules, is there a diplomatic way to address this without making a person exemplified on or excluded? 4) Would you like a judging component, run like last year? Any other thoughts or opinions are welcome, just please don't name names. 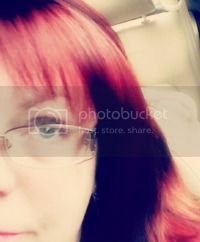 If you wish, you can choose to post anonymously. And please spread the news about this poll. I need any thoughts ASAP. 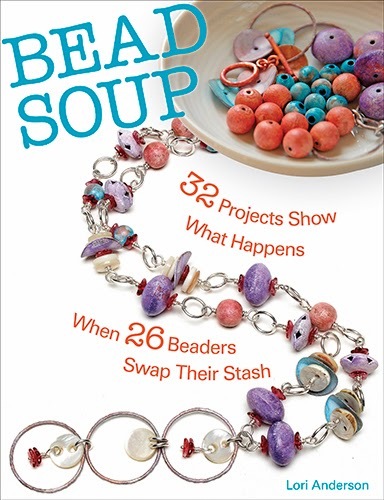 the 8th Bead Soup Blog Hop Sign Ups are Coming Soon! 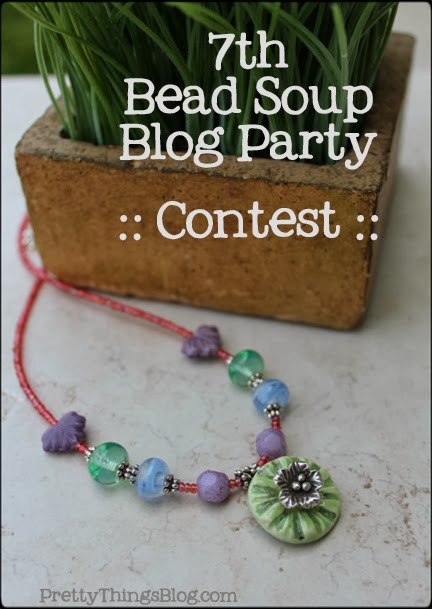 A lot of people have asked if I've felt like having a Bead Soup Blog Party (also known as the BSBP) because my recovery from Lyme disease and a bunch of cross diseases is still underway. The book that came about because of the parties. The answer is YES. However, there will be some changes to make it more streamlined. 1) There will only be ONE sign up day. Only 24 hours. but this year will have a strict 24 hours. to participate in other blog hops. and there are a couple of other things I'm working out. A Bead Soup I received. 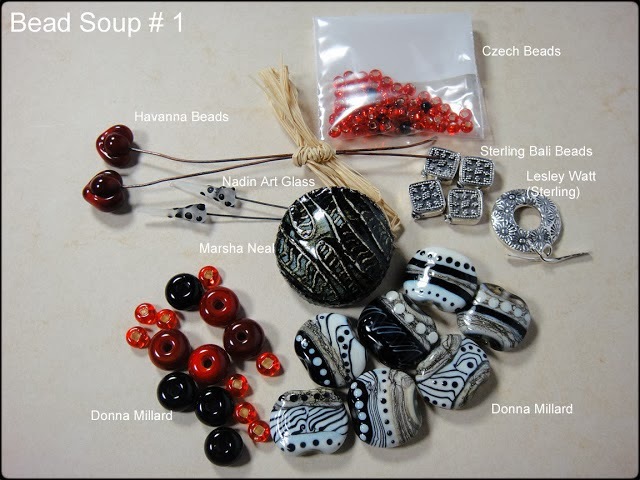 I will be announcing the dates on this page, at www.BeadSoupBlogParty.com, on the Facebook group www.BeadSoupCafe.com, and my personal Facebook.page. I will also create a Facebook invite. Now is a good time to check your account and see if you are set up to receive invites (they show up in the right top corner of your Facebook page), and also see if you clicked to receive an email when someone invites you to something.